We are working on bringing you some geo stats and in the mean time I’d like to share some global Windows Phone usage statistics based on data from a couple of days of activity in close to 700 apps on AdDuplex network. United States becomes less dominant (even though still a clear leader) while countries were Windows Phone was launched in a second wave are getting more and more traction. Russia nearly doubled its share (from 3% to 6%), India came up from below the radar (at less than 1%) to a respectable 4% mark, Netherlands – from 1% to 2%. 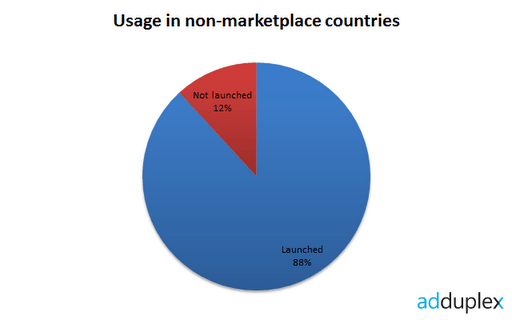 We can see that launching the phone and Marketplace in a country increases usage dramatically, as it should. 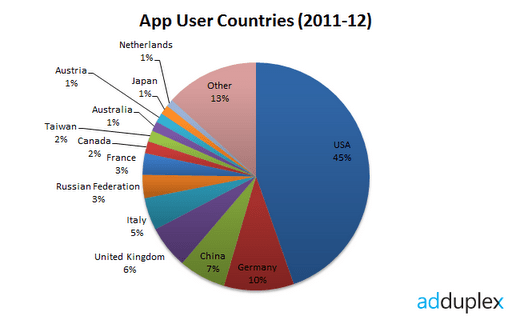 12% of the users come from unsupported countries. 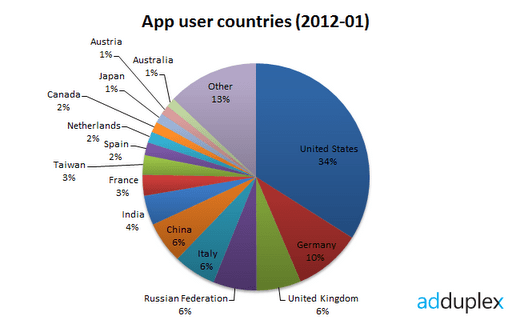 This number includes China (7%) since the marketplace is not yet live there. One can assume that the rest of the world doesn’t matter because it’s only 5% of the users, but that would be a false assumption. It is only 5% precisely because it’s not supported and not the other way around. I’ll try to post a similar chart every month so we can see the progress. You can find a list of all logged countries and their share after the break.